Card Text Action: For the remainder of the turn, gain 1 each time a creature reaps. 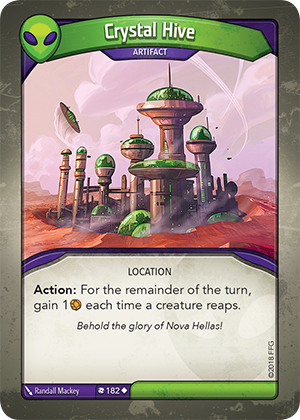 Flavor text Behold the glory of Nova Hellas! If I use Crystal Hive’s “Action:” ability and reap with a creature, when do I gain the additional Æmber for reaping with a creature? The Æmber is gained when you reap, after gaining the regular Æmber, but before any “Reap:” abilities are resolved. But don’t I already gain 1 Æmber each time a creature reaps? Yes. Crystal Hive’s “Action:” ability allows you gain an additional 1 Æmber whenever a creature reaps. Therefore, while Crystal Hive’s “Action:” ability is active, you gain 2 Æmber each time a creature reaps.